Truly the heart of Charleston's shopping scene, like many of this notable city's attractions, the City Market is steeped in history, and promises to charm visitors with its impressive exterior, warm hospitality and unique surprises that are just past the prestigiously pillared front door. The first public market in the city of Charleston dates back to 1692, and was located close to the curret market at the corner of Broad and Meeting streets. For decades, plantation farmers, fishermen, butchers and other commercial vendors would hit the streets and sell their wares in the heart of town, until a formal brick building was placed on the site to acknowledge and house the growing market gathering. This all changed in 1788, when famous Revolutionary War general Charles Cotesworth Pinckney ceded a long strip of land to the city of Charleston that stretched all the way from Market Street to the docks of the Charleston Harbor. He asked that this long parcel be used as a new public market, and that is be used for this purpose and this purpose alone in the years to come. As a result of this request, low shed-like buildings were placed in the narrow site from the original Market Hall nearly all the way to the waterfront, between 1804 and 1830. The long structures originally served as a venue for local meat, vegetable and fish markets, with available "spaces" rented out at the rate of $1.00 for day, or $2.00 if the site of choice also contained a cold slab of marble to protect the meat or fish from the typical Charleston heat. Not always the most pleasant spot on a hot summer day, butchers and fishmongers would often throw away the leftover scraps out into the neighboring streets, attracting buzzards to the city's center, and earning the congregating birds the nickname of "Charleston Eagles." In 1838, a fire destroyed the main market's entrance, and the city of Charleston recruited architect Edward B. White to design the current Market Hall in 1841 for the modest fee of $300. His ensuing building was essentially a replica of the Temple of the Wingless Victory in Athens, Greece, with four stone pillars guarding the entrance of the marketplace. This remarkable building would eventually become a meeting place for Market Commissioners, as well as serve as a popular elite venue for social functions and galas. The 1841 Market Hall and the original brick one-story "sheds," both of which are listed on the National Register of Historic Places, are still standing, and are still just as popular with locals and visitors alike as they ever were. The low-lying open air stalls within the sheds, in addition to the areas opposite the market on both sides of the narrow blocks, are home to well over 100 vendors that specialize in any number of local products or crafts. 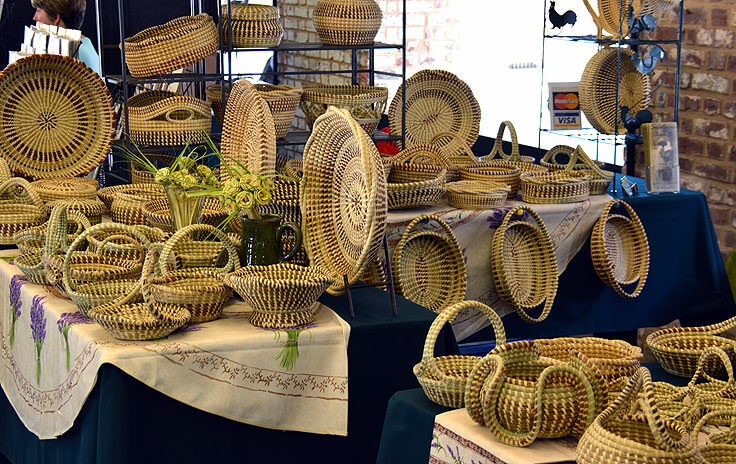 Every "shop" has its own unique flavor and character, with the staples that the market has always been known for, like fresh produce, meats, spices, and locally crafted sweetgrass baskets, as well as more modern goods that will make any shopper swoon. Clothing, artwork, jewelry, local souvenirs, home decor, local crafts, perfumes, food, toys, toiletries and other gift items can all be found in abundance here, and virtually every piece has a unique regional origin, and a handcrafted one-of-a-kind quality that truly can't be found anywhere else on the East Coast. Inside, the market is always fairly crowded, (just as it always has been), but patrons will find plenty of elbow room to browse from one stall or shop to the next. 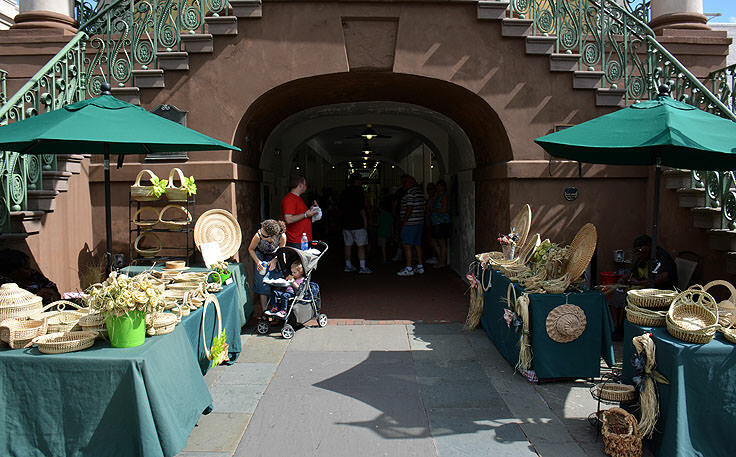 A mixture of both locals and tourists, the market does a good job of cementing its centuries-old reputation of being a "meeting place" for Charleston regulars and newcomers from all over the globe. 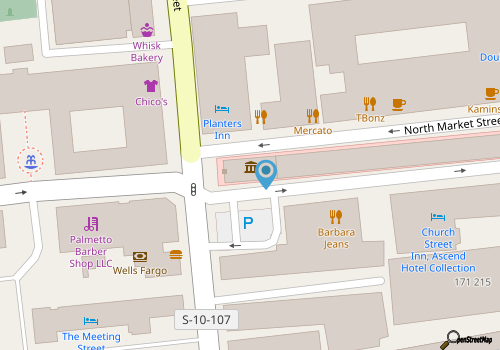 There are several restaurants complete with patio seating for a quick or leisurely bite during a long hard day of shopping, in addition to several hotels and inns that are conveniently placed just outside the market's open doors. A parking garage is also located nearby to allow visitors with armfuls of bags easy access in and out of the City Market. The City Market is open every day, from the early morning hours until about 6:00 p.m., and the market itself is free to enter and explore. A favorite spot for souvenirs, as well as the home to the Daughters of the Confederacy Museum in the main Market Hall building facing Meeting Street, many Charleston shopping fans dedicate a full morning or an entire day to wandering through the extensive four blocks of shops. Seasoned travelers often liken Charleston's City Market to Boston Massachusetts's famed Faneuil Hall, and it's a solidly sound comparison. 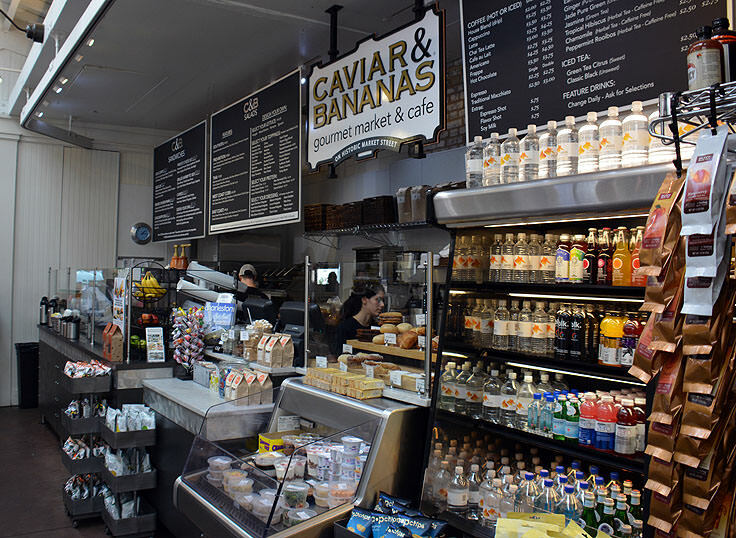 Delightfully historic and a star attraction in an already thriving tourism scene, the City Market is generally considered a "must see" spot for any new Charleston visitor. 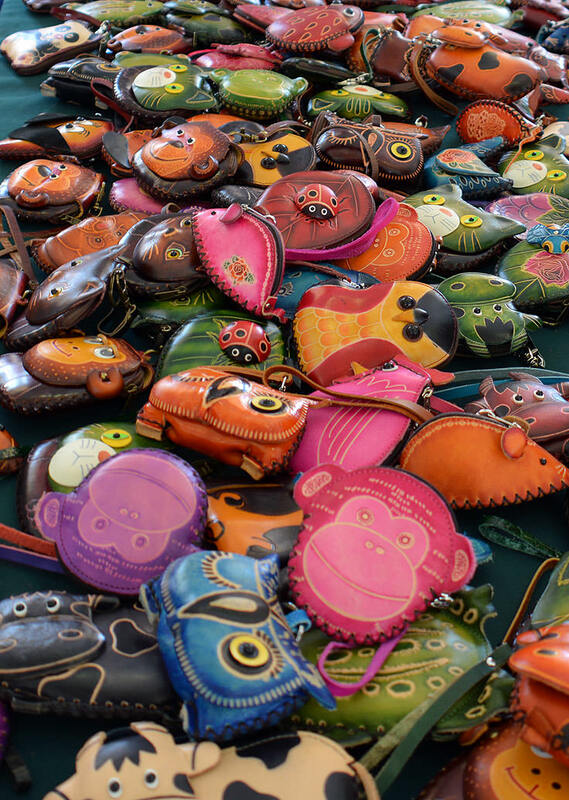 Happily, the City Market still has an air of authenticity as well, as with well over 100 local vendors and shops that can't be found anywhere else in the state or even the country, shoppers will find the unique collection of treasures and goods simply enthralling. Worth a visit or two during any Charleston stay, the City Market remains a thriving element of the historic city that is prized by locals and visitors alike. Spend a full day shopping, or take a quiet carriage tour admiring the centuries' old architecture, and it will quickly become clear why this is one of Charleston's favorite local landmarks.